Winter in Europe usually means low temperatures and snow, depending on the country that you're planning to visit. However, if you're not a fan of snow and typical winter weather, there are still a few places in Europe where the temperatures are mild and the weather allows for visitors to enjoy some much needed winter sun. The south of Spain enjoys a sunny and beautiful weather all year round, with temperatures still reaching 18 to 20 Celsius in December in Malaga, Sevilla or Cordoba. Although it may not be warm enough to lounge on the beach or swim, it's still warm enough to walk around without freezing to death, while still enjoying outdoor dining when the sun is out. Visiting Andalusia during winter means less tourists compared to the summer months, better prices for flights and accommodation and less crowded attractions. You could rent a car and do a tour of the region, hitting Seville, Jerez de la Frontera, Cadiz, Malaga and even Granada. There's also the route of the pueblos blancos, plus other lovely places like Ronda, Tarifa or Marbella. Cyprus has a sub-tropical climate, which means mild winters on the coast, although it is possible to see some snowfalls in the Troodos Mountains. In the day time there are still around 20 - 22 Celsius in December or January, which means that you can leave your thick coat at home and just bring a light jacket for the evenings. Although Cyprus is most popular in summer, you can still go our for a winter break or to spend Christmas or New Year's Eve on the island. Cyprus is one of the hottest places in Europe during winter, with over 3200 annual hours of sunshine on the coast. Most popular tourist destinations in Cyprus are Paphos, Limassol and Aya Napa. Cyprus is a place full of culture and history, so there's lots to see if you want to go out and explore, or you could just book a nice hotel and soak up some winter sun by the pool. In the spring there's also a nice carnival festival in Limassol, which is very popular in Cyprus. Madeira is a Portuguese archipelago situated in the Atlantic Ocean, just 250 miles north of Tenerife. Madeira has a Mediterranean climate, although the weather can differ from one island to another and even from one part of the island to the other, just like in the Canary Islands. In the mountains of Madeira you can expect snow during the winter months and also rain, which mostly falls between October and April. If you can accept the fact that you may get a rainy day or two during your holiday, Madeira still is one of the best and warmest tourist destinations in Europe in winter, because as you can see from the image below, temperatures still rise above 20 Celsius during the day, which means you'll be able to walk around wearing just a T-shirt. Best time to visit Madeira during winter is for New Year's Eve, when the island hosts the largest fireworks show in the world, an event which you should see at least one in your lifetime. Of course we couldn't talk about warm weather in winter in Europe without mentioning the tiny island of Malta. Malta enjoys a Mediterranean climate, which means mild winters, with temperatures around 15 to 19 Celsius during the daytime. Although not as warm as some of the other destinations mentioned before, the weather is still warm enough to allow for city-breaks and visiting, as there are lots of cool places to the on the island. There's more to Malta than being a beach destination and the winter season is a great time to explore its territory, without bumping into tourists at all times. Malta has around 3000 hours of sun per year, which almost guarantees a sunny holiday, even though the temperatures may not be as high as in the previous destinations mentioned. The Canary Islands have one of the best climate in the world and here you can enjoy a day on the beach and a swim in the ocean at any time of the year. The Canary Islands are part of Spain, so you can travel here just as you would to any other part of Spain. The islands are located very close to the coast of Morocco, with Fuerteventura being the closest island to the continent of Africa. Winter is considered as high season in the Canary Islands, due to the fact that many people from the north of Europe and the UK come here to live for a few months between December and March or April, enjoying the winter sun and warm temperatures of the Canaries. If you don't know the island and you don't already have a favourite, we would recommend Tenerife or Gran Canaria as the best places for a winter break. 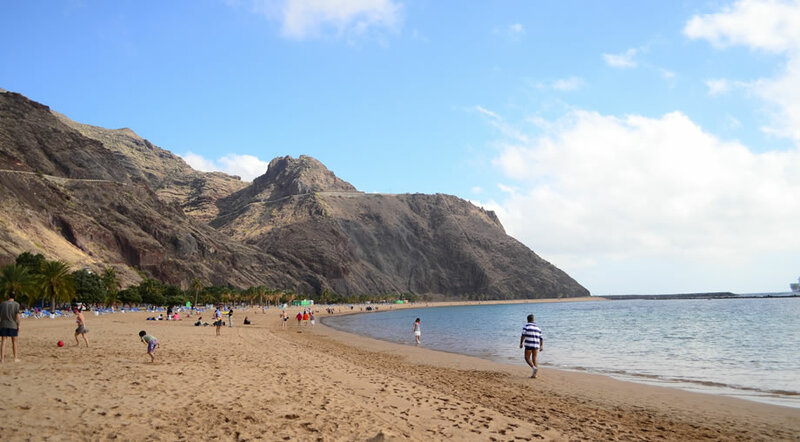 The south of Tenerife has a warmer climate compared to the north of the island, which is why most of the tourist resorts are concentrated here. You can read our article about the warmest Canary Island, but keep in mind that all the islands enjoy great weather and the differences are not huge, so you should choose in accordance to what you'd like to do and see during your time spent there. Temperatures still rise above 20 Celsius on most days and you can see more photos of Tenerife in December, to get a better view of how the weather usually is. Although the Canary Islands are the hottest place to visit in Europe in winter, you can still get the odd rainy days or a calima, a phenomenon that happens a few times per year in these islands. Depending on what activities you prefer during a holiday, you can look here and decide which Canary Island you should visit. Winter sun holiday destinations in Europe – they are closer than you think! When most people think of visiting Europe in winter, they think of sky vacations, heavy snow, Christmas markets in Germany, the Swiss Alps and other similar images. And although for some a white winter is the perfect scenario, that is not true in all cases. There are some (ourselves included) who prefer a bit of winter sun and warm weather. And if it’s somewhere near a beach or the sea, even better! So, this is our list of recommended places for a warm winter holiday in Europe. Remember that while the temperatures might not seem hot enough for you, when the sun is out shining, you will feel it like it’s much hotter than it actually is. UV protection is still necessary even when sunbathing in winter, so don’t forget about protecting your skin! If you're looking for the best holiday destinations in December in Europe, then take a look at our list below. Most places in Europe are under heavy snow in the first month of the year, but not the ones we recommend you. Here's a list of the hottest places in Europe in January. Thinking of spending Valentine’s Day in a warm destination? If you want to stay within European borders, these are your best options for warm places in February.